There are at least three problems with this argument that I can see. The first is that right now, qualified borrowers can get a 30-year-fixed jumbo mortgage for a lower interest rate than banks charge for a conforming mortgage. 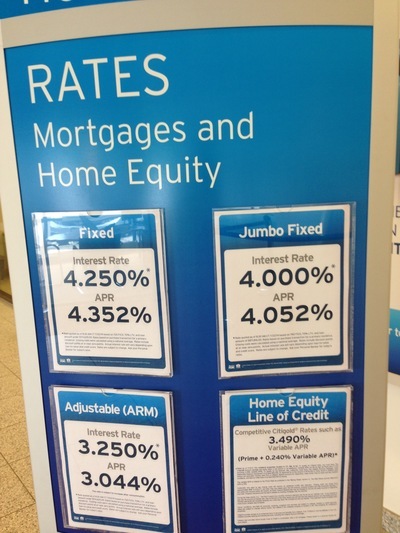 The mortgage rate sign inside a Citibank branch this summer shows jumbo 30-year-fixed rates lower than conforming rates. The difference is that on the conforming mortgages the federal government is taking a profit. The profit arguably belongs to Fannie Mae shareholders who had their rights to it wrongly confiscated by President George W. Bush and Henry Paulson, but that is another story — the point here is that banks are offering 30-year-fixed jumbo mortgages right now with no federal "hedge against interest rate risk" other than the Federal Reserve and the promise of another tarp-style rescue. The second is that the mere fact that there is not "some means for lenders to purchase from the federal government a hedge against interest-rate risk over a 30-year mortgage" doesn't mean that there's no way for lenders to purchase such a hedge from someone else. There is a whole financial industry that specializes in pricing, buying, selling, and insuring risk. That might introduce some additional counterparty risk into the equation for the lenders. The third point is, what is so sacred about a 30-year-fixed-rate mortgage? In Canada, mortgage rates are fixed for only five years at a time, and mortgages amortize for no more than 25 years. Yet the home ownership rates there in 2011 were higher than in America (see chart 4 here). Why not make the loan term what's best for the lender and the borrower, rather than what Congressman Frank thinks is best for everyone? Data show that a majority of home buyers will move out of their homes in somewhere between 13 and 22 years. First-time home buyers sell even more quickly. Why should the government push home loans that outlast the time that buyers even stay in the homes?